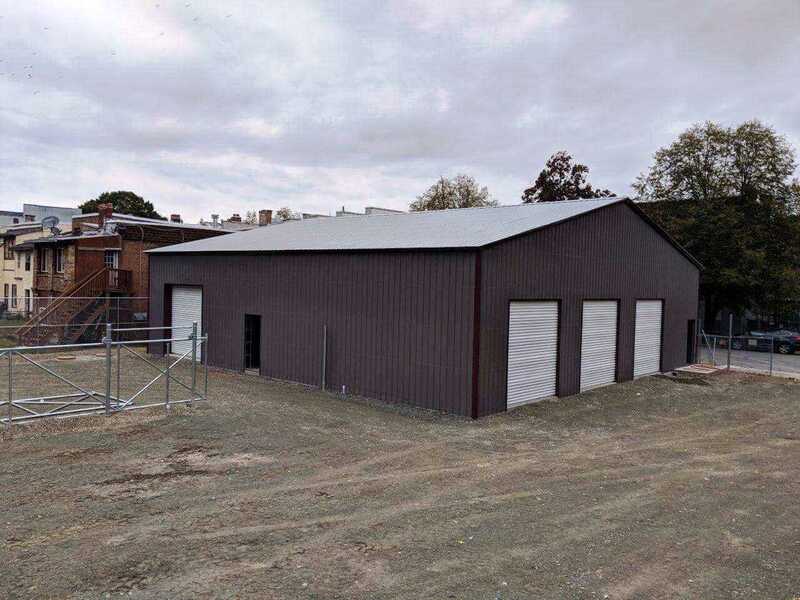 As opposed to the more common widths of 40 or 50 feet, a 60’-wide metal building from Metal Barn Central gives you extra space to meet more of your storage needs and our 60×100 metal building has a TON of space! You can also customize the building height to your specifications, giving you the ability to accommodate taller vehicles or equipment, including everything from an RV to a combine harvester. What could you do with 6000 feet of open, column-free space? This 60’-wide steel building can be customized and divided any way you choose. 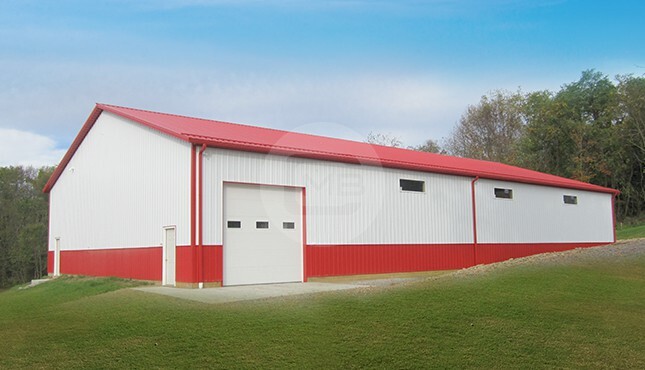 This 60’x100’ commercial facility provides a versatile solution for warehouse needs, agricultural operations, office space, manufacturing, or whatever other needs you may have. The only limit to the potential uses of this multipurpose structure is your imagination! This building is ideal for all sorts of applications from business to manufacturing to agricultural. Several businesses need a dividable space, with a front area for customers and a back area for work and storage. This is a common need for auto service centers, restaurants, medical practices, appliance dealers, and furniture stores. Or perhaps you have a manufacturing plant, and you need to meet OSHA requirements to keep your manufacturing space and office space separate. Or maybe you’re a farmer who needs separate spaces for your horse stalls and dairy barn. Alternatively, you could keep hay and equipment on one side of the building, and livestock on the other. Or maybe you need a church sanctuary (this building could easily seat over 300 people). Or perhaps you need to house your growing dance studio, or karate dojo, or fitness center. And if you need a practice facility for your school or community league, this building can accommodate a full-size basketball court (or volleyball, wrestling, indoor tennis court, etc.). As you can see, the possibilities for a 50’x100’ metal facility from Metal Barn Central are endless! 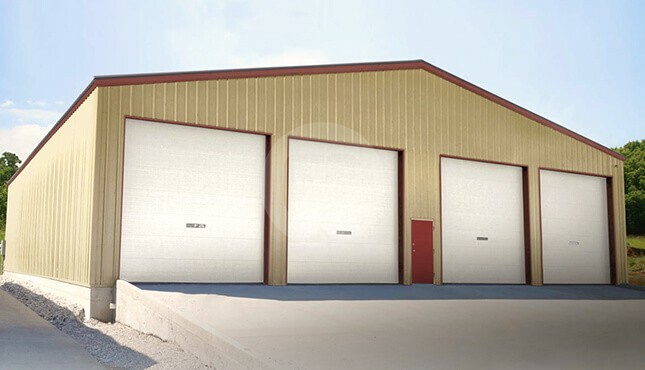 Your 60’-wide commercial building can be equipped with garage doors, walk-in doors, windows, gables, different roof styles, and other customization options for full functionality and convenience. Looking for a specific color, or dual-tone option? We have many, many colors from which you can choose. Select your wind speed or snow load ratings needed to obtain your local permits, and we can provide you with a certified building that comes complete with architectural blueprints. Why Choose an Engineered Metal Building from Metal Barn Central? Great financing options available, too! At Metal Barn Central, we’re about much more than just selling you a metal building – we’re about providing shelter for your way of life. Give us a call today at (980) 321-9898, and see the Metal Barn Central difference for yourself!